Los Angeles Clippers, my new family! 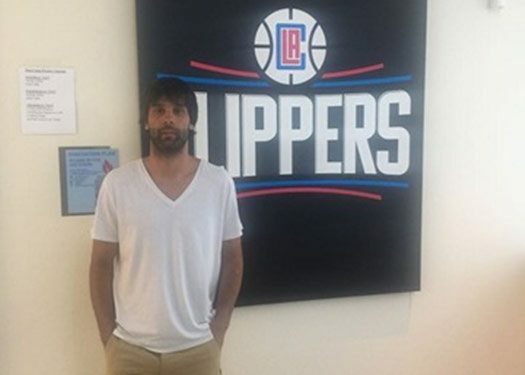 Milos Teodosic signed with the Clippers and writes on his blog on Eurohoops about the reasons he chose them, the red and blue colors, and all the people he feels the need to thank after his move to the NBA! The Serb magician made the move to the NBA, he is ready to prove what he can do in the best league of the world and he sent us this text from Los Angeles. During the season, I had made clear here, through my official blog at Eurohoops.net, that I was going to give everything I had for CSKA Moscow and then, my next goal was to sign with an NBA team! I had made the decision, I felt it was the right timing for me, and I know it’s the best time for this because I feel more than ready competitively, mentally, and physically. The Los Angeles Clippers are my next team and I’m very happy about that! I will do everything I can to vindicate the people who chose me and trusted me. I had said before that the most important criterion as to who I was going to sign within the NBA would be the role I would have and to feel that the team’s people have a specific plan for me. That they know who I am, my advantages and disadvantages, and that they know how to utilize me so that I can give 100%. From the very first moment the talks began with the Clippers I knew that this was going to be my new family! They made me feel very comfortable, they convinced me that they have faith in me, and it’s important that here I will have the time, the opportunities, and the role I need in order to adjust and prove what I can do in the NBA. I want to thank coach Doc Rivers, General Manager, Dave Wohl and the executive vice president of basketball operations Lawrence Frank. I’m looking forward for the season to start and for my own adventure in the NBA to kick off. Those who know me know that I’m not worried, I don’t feel pressure, and the only thing I have to do is to be myself. To focus on the basketball, to work, to understand exactly what the coaching staff wants from me and make it happen on the court. The games during the regular season are many, but last year’s long season in the EuroLeague, in combination with the commitments of the VTB League, was the perfect… adjustment stage for me, so that I could take the step to the NBA even more prepared! I’m going to give 100% and my mentality isn’t going to change. I want to win, I want to play for titles, to make my teammates better, to offer substance and spectacle. We have great material and I’m glad that I will have athletes and players like Blake Griffin and DeAndre Jordan by my side! I’m sure that we’re going to produce great plays and form an excellent partnership that the Clippers fans will enjoy as well! I feel very good about my decision, the negotiations didn’t last long and we reached an agreement quickly. Perhaps the fact that the red and blue are the colors of the Los Angeles Clippers like they are for my home country’s national team, is a sign that it will feel like home and I will have the career I’ve been dreaming of in the NBA! I thank CSKA, my mind is on the national team! I want to thank, from the bottom of my heart, all the teams I played for in my professional career. All of them have helped me grow and become the player I am today. CSKA Moscow deserves an even bigger thank you. I played for this club for six years. We had some very beautiful and difficult moments, we won titles, and we even experienced some sorrows. They always supported me, they were always by my side and this I will not forget! I would like to personally thank Andrey Vatutin, all the coaches that I had and, of course, Dimitrios Itoudis, and my agent Nick Lotsos, who has done so much for me all these years we’ve been working together. Before I travel to Los Angeles to settle in the USA and my big challenge that’s called “Los Angeles Clippers” begins, I’m thinking of my home country’s national team. We’ve achieved great things over the last 8 years; we’ve essentially defeated every team in the world except for the USA in the World Championship and the Olympic Games, but this generation still has a big unfulfilled goal. A gold medal! I owe a lot to the Serbian national team. I believe that, on my part, I’ve contributed and given joy, but we still have a lot to accomplish, with the EuroBasket being the next big goal that’s on my mind! Be well, I’ll be sharing my thoughts with you next season through my blog at Eurohoops.net!